Thanks to Julie & Rachel for this FrugalBaby Tip! I use a Kitchen garbage pail for my main pail that I love. It's by Tucker and it has a pop-top lid and a slot for a charcoal filter. But upstairs I just have a regular Rubbermaid kitchen container with no DeoDisk, and I have no odor problems really. I don't use a DeoDisk, and I have no odor problems. If you have a tight-fitting lid, you shouldn't. I sometimes put a splash of vinegar in the bottom of the pail, but that's it. 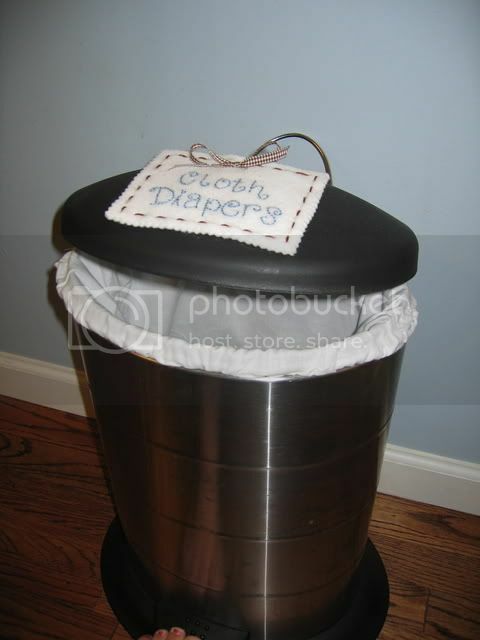 I use a Sterilite container with Snap-Tite lid for wets and a Diaper Champ for poopies. Works for us!